What is digital documentation – how can I benefit? Welcome to the very first blog post on our corporate blog. This blog is meant to serve as a clarification of why digital solutions, and more specifically, why digital documentation is beneficial for all companies and organisations, who has a data collection and -processing need. We will also post content that illustrate what we’re all about – what we do and how we do business. On this blog, you will also find tutorials and content that serve to help to master our mobile applications for your reporting needs. By subscribing to our newsletter, you will be the first to know, when we post new content to the blog. Our first blog post will answer a question, which we often encounter, when presenting our products and services to potential clients. At Miracle Q-Inspect A/S we often experience that potential clients are having difficulties seeing the benefits of converting to digital documentation, in relation to their respective reporting and data collection tasks. They just do not see why it is important to optimize this process. All of our customers experience an increase in productivity, more efficient reporting processes and an ROI, which is more or less instant after implementing our QReport system. QReport is our digital documentation software and you can read more about it here or access the site navigation. Digital documentation is about optimizing archaic documentation processes, making it possible for organisations to operate more efficiently and more profitable through a digital system. For instance, when performing building inspections or other quality control tasks, traditional methods require the inspector to carry an abundance of documentation material such as physical documents, pen and paper, camera, audio recording devices, camera etc. However, these can be made obsolete by converting the inspection task to an app, used on the inspector’s mobile device. All of the sudden the inspector can perform all his documentation tasks using a single mobile application. Our QReport system can be used as such an application on mobile devices. But that is not all, before the digital migration, the inspector had to collect all of his data from each reporting tool and then manually construct a report. 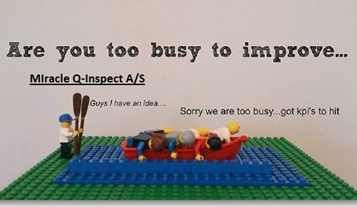 Miracle Q-Inspect exist to optimize this process. With our QReport system the collected data is automatically converted into fully functional and professional reports. Greatly decreasing time consumption and potential errors, when writing reports. Thus, there is a definite advantage to migrating your data collection and -reporting activities into digital documentation tools and applications. You can read more about the benefits of digital documentation here. Thank you so much for visiting our blog – Let’s get social, follow us on LinkedIn or Twitter and be the first to receive new content regarding digital documentation. If you want to receive more information about our digital documentation services then feel free to contact us directly.